On Friday I emailed the mayor, city council and the chief of police regarding the protest rules and policies at city hall and the streets of #Oakland. So far I got two responses from Council President Lynette McElhaney and Chief Whent. I will update more if I get other responses. I am writing to you as a resident of District 2 and private citizen. My thoughts do not reflect the opinions or beliefs of groups that I am associated with. (I apologize for the length. But I have a lot of thoughts. I bolded the important points. Feel free to read and/or address what applies to you). I am writing to express disappointment in 1. New rules and regulations regarding organized protesting in the streets, 2. Rules regarding participation in city council meetings and 3. Certain public comments made on the record at city council meetings. I do not agree with the new rule that protestors that must stay off the streets at night. I think it unfairly punishes community activists and demonstrators who express their opinions in a peaceful manner. Mayor Schaaf, recent email communications that you have released show that you had received advice from a civil rights attorney, and that you expressed that you did not like the idea of mass arrests. I do not think placing rules on street protesting which effects the majority and not focusing on the few who cause destruction, is a good idea either. Recently, the police department has shown restraint in enforcing the rule during a couple of recent protests and during the celebration of the Warrior’s win this past Tuesday. On Tuesday, when countless number of celebrants congregated downtown, instead of corralling the masses of people, the police decided to protect vulnerable businesses. This apparently was successful because I have not heard any reports of mass destruction happening on Tuesday Night. I urge the Mayor and Police Chief to continue adopting this strategy for future demonstrations. Focus police efforts on preventing vandalism and crime that occurs throughout the city, instead of placing your energy on preventing spontaneous peaceful demonstrations. I understand that the new ‘rules’ regarding signing in at City Council Meetings, closing the upstairs galleries, searching bags and regulating who can sit inside Council Chambers during the meeting or not are efforts to prevent what happened in early May, where protestors shut down a city council meeting and stopped city business from taking place. I do not believe these new rules are fair, or do they necessarily achieve the results you are looking for, even if they ‘working’ for now. Instead these measures are demoralizing and acts to discourage community participation. They aren’t even universally enforced. I came to the city council meeting last night. I entered the building and asked to attend the meeting. Security welcomed me in a friendly manner, and directed me up stairs. I didn’t have to sign in- though a sheet was visible. I wasn’t searched. Though 3 police officers were there ready to frisk me if need be. My bag was untouched. It was only when I tried to enter council chambers when I hit a road block. Staff told me there was no room in council chambers, but if I wanted to speak I can sign up on a list. A long list. I decided not to stay. Various social media posts belied the statement that there was no room in council chambers. Also various residents have shared that they were searched in order to attend. So not only are these rules unfair, but they are arbitrarily enforced. I went to home to watch. I wasn’t ‘prevented’ from participating literally, but I wasn’t welcomed by city staff. A citizen more sensitive than I, or without cable at home to watch, might have felt discouraged. I’d also like to add other ‘lawful’ procedures of scheduling controversial items towards the end of regularly scheduled meetings and scheduling special meetings at times difficult for a lot of residents to attend, achieve the same discouraging results and are equally disappointing. I have expressed this opinion before, either through SpeakUpOakland.org, via twitter or via blog post that some of you may have read. I’d like to reiterate via email (and as public record) that you please reconsider this strategy. Protests and demonstrations don’t happen often enough to warrant these actions. They happen when the community feels like they aren’t being heard. The results help to make your decisions more informed and help you to consider something you hadn’t before. As a result of E12th affordable housing protest, you were able to negotiate a better deal. To coin CM Kalb’s phrase last night .. “Make lemonade out of lemons”. These new city council meeting rules are made according to council discretion. You don’t have to do this. Please reconsider. Finally, I would like to express my disappointment on the vote regarding the E12th Parcel last night and comments made on the record. And the city attorney office refused to address the letter at the meeting to assure residents that the contract is under compliance. The seemingly lack of interest to publicly make sure that this project is lawful (by ALL council members – with the exception of Kalb and Gallo for at least raising the questions) really erodes the confidence that the community has in the council’s ability to conduct business ethically. Merely stating “I didn’t like this at first” does not qualify. I don’t know what happens behind the scenes, maybe you grilled the city attorney for hours. I don’t know, but show us that you did. Do your due diligence and show the community that this project is lawful. *Please note that I expressed disagreement with this decision based on compliance with state law via SpeakupOakland.org before last night’s vote. I do not like that a member of city council participated and publicly commented on class division in this city.I am part of the “working middle class”. I certainly don’t feel middle class, but definitely wouldn’t classify myself as poor. I’m in fear that one day I won’t be able to afford to continue living in Oakland. I appreciate that council is trying to relieve the pressure placed on middle class residents by the upper class competing for market rate housing. (I don’t know if it will work, but I guess we will see). What I don’t appreciate are comments by elected officials, who are supposed to represent everyone that effectively pits one class against the other. Council President Lynette McElhaney’s comment on the record, that “it is interesting that affordable housing advocates don’t seem to want workforce housing” (not verbatim) is inflammatory, divisive and insulting. It’s especially condescending coming from someone sporting a Warriors championship hat speaking to a community who could probably never afford to attend a championship game… (I know you guys probably get a discount or something to attend the game, but that just sent a horrible message). The working poor are fighting for their survival. They worry about being able to afford a roof over their heads. They don’t need to carry the EXTRA burden of making sure that their survival doesn’t “hurt the middle class”. They definitely don’t need to have that burden placed upon them by someone who is supposed to represent everyone’s interest. Middle class residents like myself are also struggling, but we have agency and a voice to express that struggle. And plenty did. I do not think it is appropriate that elected officials weigh in on the record and ‘choose sides’ so to speak. This council and current administration certainly likes to make speeches about how they understand their constituents are hurting. Actions demonstrate that not only are you actively making it difficult for community to express their hurt by implementing rules to limit the community’s ability to have a voice (rules to limit participation in city council meetings, or organized protests), but your votes and on the record commentary about such votes, show whose side you truly are on. If you are going to vote a certain way…fine. But don’t chastise a community trying to defend their survival while doing so. That’s just cruel. Better to just vote and not comment at all. The E12th parcel is just one battle and there are many to come. You won’t always vote in the interest of low-income community. That’s accepted. However, I hope the council in the future can be more mindful of how their actions and comments make fighting these battles more difficult for those who are most vulnerable and make every effort to do and BE better. (For transparency, I posted comment #3 on my FB account and tweeted it. Titled: “TDL Oakland City Council Update”. Thoughts about the new protest and city council rules can be found on my blog -linked below). Police Chief Sean Whent – June 19th. Ms. Love, thank you for your email. I would like to point out as couple of things though. Despite numerous stories in the media, we have not implemented any ban on nighttime demonstrations or even marches. We have continued to facilitate all demonstrations, as is required by our policy. We have made some adjustments to our tactics and generally try to be closer to groups as they march and further from them if they are stationary. This is entirely to discourage the kind of destruction we have consistently seen that has arisen out of nighttime marches. I would very much like to be able to catch vandals that destroy our city but I would prefer to prevent it from occurring in the first place. As for council meetings, the Oakland Police Department does not set policy for security measures at city hall. We make recommendations to the city administrator but ultimately, we are not decision makers in this area. I certainly agree that whatever rules are put in place, they should be applied consistently. I appreciate you taking the time to write and thank you for your input. Screen capture of email from Police Chief Sean Whent, June 19th. 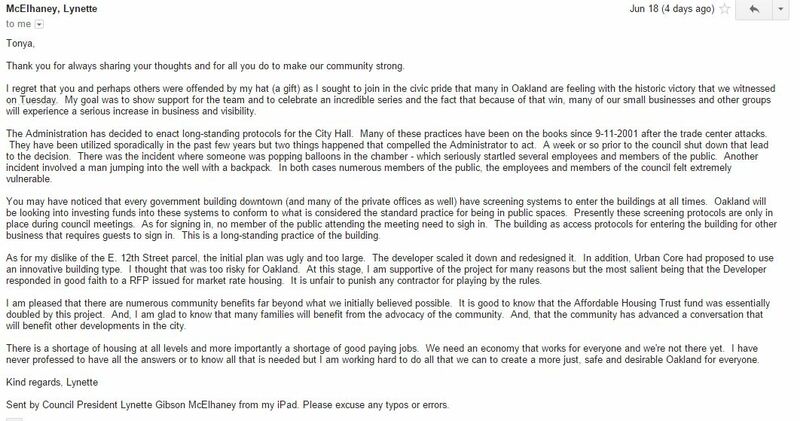 Oakland City Council President Lynette McElhaney- June 19th. Thank you for always sharing your thoughts and for all you do to make our community strong. I regret that you and perhaps others were offended by my hat (a gift) as I sought to join in the civic pride that many in Oakland are feeling with the historic victory that we witnessedon Tuesday. My goal was to show support for the team and to celebrate an incredible series and the fact that because of that win, many of our small businesses and other groups will experience a serious increase in business and visibility. The Administration has decided to enact long-standing protocols for the City Hall. Many of these practices have been on the books since 9-11-2001 after the trade center attacks. They have been utilized sporadically in the past few years but two things happened that compelled the Administrator to act. A week or so prior to the council shut down that lead to the decision. There was the incident where someone was popping balloons in the chamber – which seriously startled several employees and members of the public. Another incident involved a man jumping into the well with a backpack. In both cases numerous members of the public, the employees and members of the council felt extremely vulnerable. You may have noticed that every government building downtown (and many of the private offices as well) have screening systems to enter the buildings at all times. Oakland will be looking into investing funds into these systems to conform to what is considered the standard practice for being in public spaces. Presently these screening protocols are only in place during council meetings. As for signing in, no member of the public attending the meeting need to sigh in. The building as access protocols for entering the building for other business that requires guests to sign in. This is a long-standing practice of the building. As for my dislike of the E. 12th Street parcel, the initial plan was ugly and too large. The developer scaled it down and redesigned it. In addition, Urban Core had proposed to use an innovative building type. I thought that was too risky for Oakland. At this stage, I am supportive of the project for many reasons but the most salient being that the Developer responded in good faith to a RFP issued for market rate housing. It is unfair to punish any contractor for playing by the rules. I am pleased that there are numerous community benefits far beyond what we initially believed possible. It is good to know that the Affordable Housing Trust fund was essentially doubled by this project. And, I am glad to know that many families will benefit from the advocacy of the community. And, that the community has advanced a conversation that will benefit other developments in the city. There is a shortage of housing at all levels and more importantly a shortage of good paying jobs. We need an economy that works for everyone and we’re not there yet. I have never professed to have all the answers or to know all that is needed but I am working hard to do all that we can to create a more just, safe and desirable Oakland for everyone. Sent by Council President Lynette Gibson McElhaney from my iPad. Please excuse any typos or errors. That’s it. I will post more responses if/when they come.